In my next post, I will be turning the corner from the 17th to the 18th century. But before I do, I wanted to take a minute to look at what the non-architectural cultural scene might have looked like in Stockholm during the 1600’s. In Holland and Spain, the likes of Vermeer, Rubens, van Dyck, Rembrant, and Velazquez were painting their way through the 1600’s. However, Sweden didn’t seem to have any heavyweights on the artistic scene. Instead, the Swedish art world was focused on creating and decorating important buildings, and many of the period’s artists were engaged in creating murals and friezes in the new palaces instead of painting on canvas. This was certainly the case with Johan Sylvius and David Klöcker Ehrenstrahl who were engaged in the artistic work at the new Drottningholm Palace just outside of Stockholm. Sylvius left and Ehrenstrahl right. Otherwise, Swedish paintings tended to be rather formal portraits. Ehrenstrahl's self portrait, Michale Dahl's self portrait, and King Karl XII by David von Krafft. Another important source of art in Sweden was war booty. As Sweden fought and won many overseas wars throughout the 17th century, important art collections were brought back to the country. I also have not been able to find much in the way of Swedish music from this period. In other European countries, music composition was transitioning from Renaissance madrigals to early Baroque operas and choir pieces. The German Heinrich Schuzt wrote the first German opera, and you can listen to one of his pieces here. Another German, Johann Pachelbel, wrote his famous Canon in D. Henry Purcell was the first English composer and wrote many operas. I found that the majority of important composers during the 17th century were Italian: Marco da Galiano, Claudio Monteverdi, Girolamo Frescobaldi, and Franceso Cavalli, who wrote an opera in celebration of the marriage of France’s Louis XIV. It is also interesting to note that while Sweden was expanding its territory around the Baltic Sea, Europe was expanding its horizons across the oceans. The Dutch East India Company was founded in 1602, Jamestown in Virginia was founded in 1607, the Mayflower landed at Cape Cod in 1620, and Europeans first sighted Australia and New Zealand during the 17th century. Other 17th century European news of note included the uniting of Scotland and England when King James VI of Scotland was crowned on the English throne. Likewise, in 1682, Peter the Great ascended Russia’s throne. Although literary giant Shakespeare died in 1616, both John Locke and Renee Descartes hit their philosophical strides during this time period. I realize that this is an extremely cursory look at non-architectural culture and current events from the 1600's, but I do hope that it has painted an at least somewhat broader picture of what was going on in Sweden and Europe while Stockholm was getting its first urban plan, a new waterfront to greet the world, a new ship-building facility, and numerous new churches and palaces financed by Sweden's economic and military dominance in the Baltic region. This Wikipedia page has info on the who’s who of Swedish art: http://sv.wikipedia.org/wiki/Svensk_konst#Ren.C3.A4ssans_och_Karolinsk_barock_.2815-_och_1600-tal.29 and http://www.last.fm/ has info on just about every composer ever. Kungsträdgården is perhaps Stockholm’s first example of making a park out of terrain that is impractical to build upon. This theme was repeated many times throughout Stockholm’s history, although most of the other parks are located where granite bulbs and cliffs pop out of the earth, making the ground too rocky and jagged to build upon. Instead of a high point, Kungsträdgården was originally a low, marshy area and the point where a creek drained into the sea. Stockholm’s current landmass gives a hint of this: one can imagine today’s park being a low area separating Blasieholmen (map 1), which was once an island, from the mainland of Norrmalm. 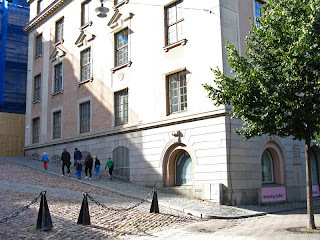 In the early 1500’s, Gustav Vasa moved the royal herb garden from Gamla Stan across the water to Kungsträdgården (the street name Trädgårdsgatan or “Garden Street” just south of the Castle points to where the old herb garden had been located). Records indicate that during Vasa’s time, in addition to herbs, onions, cucumbers, plums, and cherries were among other fruits and vegetables grown in the garden. In 1565, Vasa’s son Erik XIV converted Kungsträdgården into a pleasure garden. The fruits and vegetables were moved further north to Humlegården, a bit of land that was too rocky and bulby to build upon. Erik XIV hired the French Architect Jean Allard to design the new royal pleasure garden and orangery. Many expensive, exotic plants were transplanted into the garden, and a bit later, Gustav II Adolf brought back boxwoods after fighting in Germany. Queen Kristina, in 1635, gave the southernmost land adjoining the water to the Earl Jacob de la Gardie who built the Makalös palace on this land (see #4 in my post Palaces from the Time of Great Power in the 1600’s). 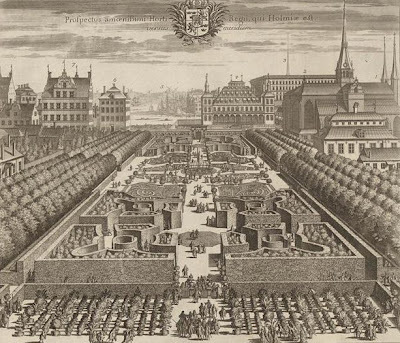 In 1648 the Queen hired another Frenchman, André Mollet, to convert the garden from the Renaissance to the more modern baroque style complete with almond-tree alées. Mollet left Sweden in 1653, and Kristina abdicated the throne in 1654. After Kristina, the kings did not have much interest in the garden and it began to decay. 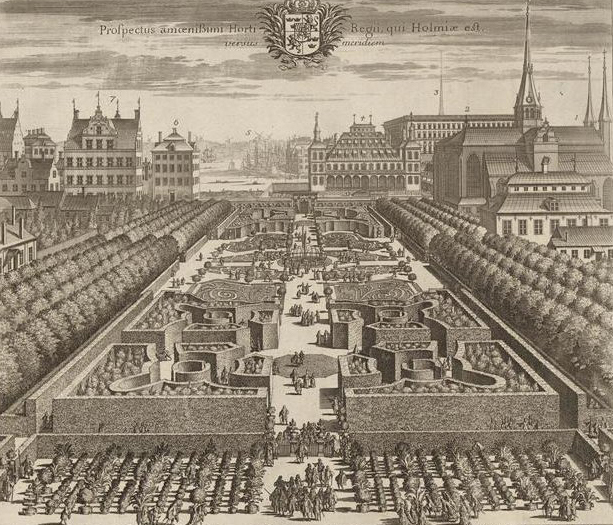 However, in the late 1600’s, Queen Hedvig Eleonora hired a garden master named Johan Hårleman to restore the gardens, and by 1690, Kungsträdgården was in top shape again. Eleonora also had a stone wall built around the garden. This stone wall replaced a tree border and was intended to keep riff-raff out of the garden. Visitation by anyone other than the Royal Family was by invitation only, and this was enforced by armed guards. During the Time of Great Power, Eleonora used the stately garden to impress visiting dignitaries. Kungsträdgården became a symbol of what Sweden was capable of. 1716 Dahlberg etching of Kungsträdgården looking southward. 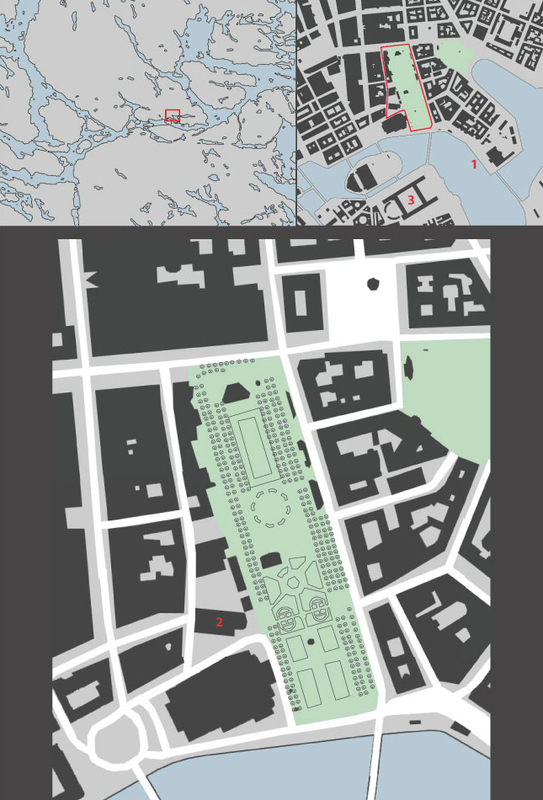 Queen Hedvig Eleonora's stone wall delineated Kungsträdgården's final form and size. Today's park consists of the area inside the stone wall plus Makalös palace's land (the palace burned in 1825). In the mid-1700’s, a more general public was allowed access to the park, but access was still limited to gentry and successful merchants. The likes of maids and street urchins were, by law, excluded. It wasn’t until Gustaf III’s death around 1795 that the park was truly open to the public. Over the centuries, Kungsträdgården has gained a collection of memorial statues and fountains. 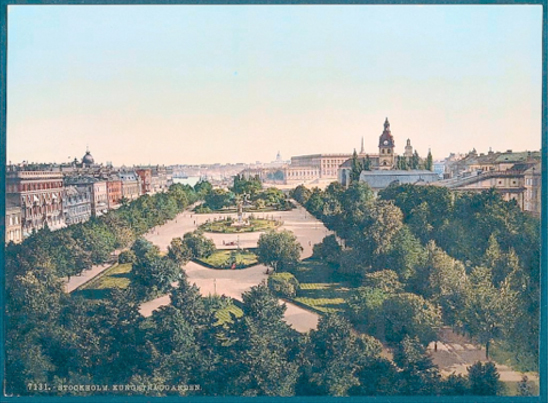 Like so many of Sweden’s extravagant baroque gardens, Kungsträdgården was modernized in the early 1800’s to be more like the popular romantic English gardens with winding, “natural” paths. Many trees were removed to allow more light into the garden and to allow for the meandering paths. The extravagant, formal gardens were replaced with simple grass lawns and un-shaped, “natural” bushes. The stone walls were removed to allow easier, freer access to the garden. By 1830, the only remaining hint of the original garden was a formal alée of trees on either side of the space. The garden became Stockholm’s favorite meeting place for all levels of society, and it remains so to this day. However, in the mid-1800’s, the park gained a bad reputation for fights and for being the living room of the “great unwashed.” In an attempt to take back and cleanse the park of the unwanted elements, the garden was slowly formalized again with straight axes, fountains, memorial statues, and large gravel spaces throughout the late-1800’s and early-1900’s. This postcard from the 1900's shows the open, gravel spaces within the park. Today's park is very similar. Electric lighting also helped to discourage unwanted activity. 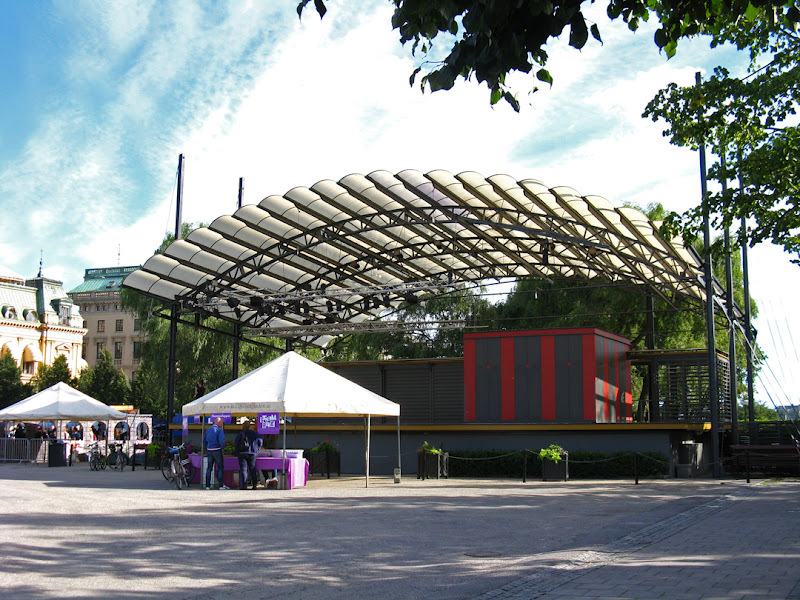 Kungsträdgården has been the site of many festivals, rallies, and protests over time, but perhaps the most famous and important was the Elm Conflict of 1971. 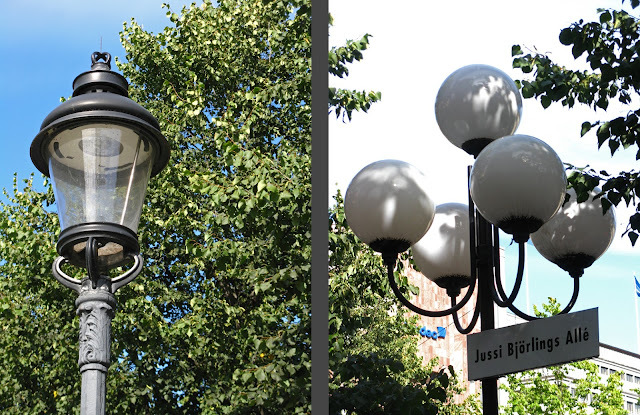 Throughout the 50’s and 60’s, Stockholm’s powerbrokers went on a modernization rampage. In the city center, thousands upon thousands of historic buildings were torn down to make way for superblocks and glass office towers. A devastating amount of Stockholm’s historic urban fabric was lost, and although many citizens fought the losses, the city’s power was too great and the citizens lost fight after fight. I’ll be blogging more about this when I make my way to the 1900’s. 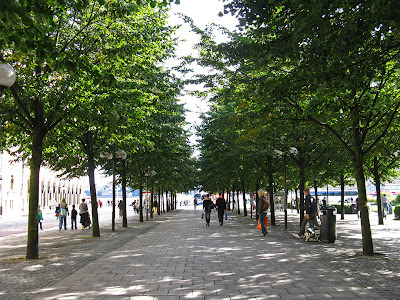 Anyway, in 1971, the city planned to raze thirteen 100+ year old elm trees in the middle of Kungsträdgården in order to make way for a new subway entrance. Stockholmers were outraged and a well-organized resistance was planned. Citizens camped in the grove by night and climbed up into the trees by day. A strained peace between the police and the demonstrators reigned for several days, but when a city-hired worker with a police bodyguard fired up a chain saw and began to cut into a tree, violence broke out. There were injuries on both the police and the demonstrators’ sides, but the end result was that the trees remained (you can still see the saw scar in one trunk). 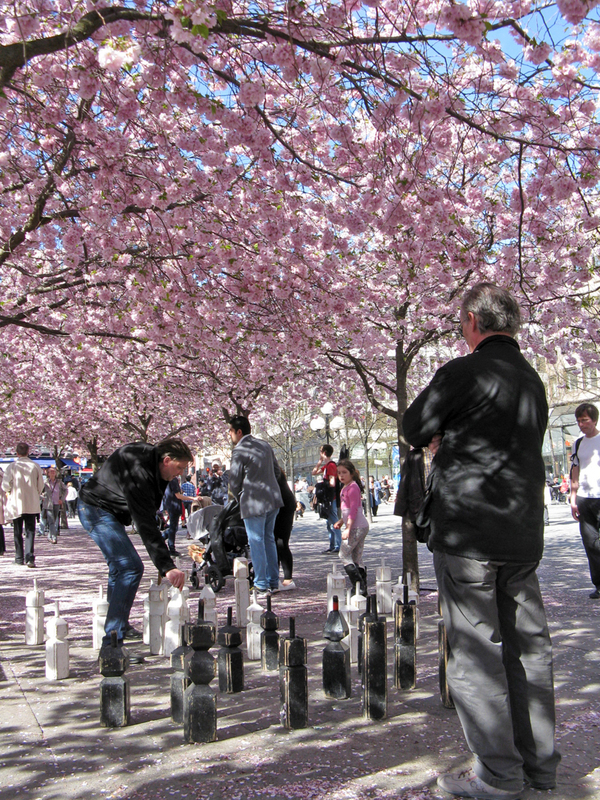 The citizens’ victory in the Elm Conflict marks the end of Stockholm’s urban revitalization craze. Today, the subway entrance lies on the edge of the park, and you can buy lunch from the 1950’s tea house and sit at a table in the elm grove. It is interesting to me to note the topography around the park and how the topography has affected development. Originally, as I mentioned above, the area was low-lying and marshy. To the east of the park, the rising elevation as you leave the park isn’t so noticeable, but just to the west of Kungsträdgården, streets rise steeply. Within a short block, street level is about 20 or 25 feet higher than in the park. On the eastern, gently-rising side of the park, imposing, richly-detailed buildings from the 1800’s dominate. But on the western, sharply-rising side, modern buildings from the 1950’s and 60’s mediate the difference in elevation. Just behind the modern buildings and up on the embankment lie older, statelier facades. Today, Kungsträdgården bustles with activity. Every day of the year there is some sort of public event—a Christmas market and ice skating in the winter, cultural festivals throughout the spring, concerts and entertainment events all summer, and more cultural food festivals in the fall. Talk about multi-use: the fountains are also planters and lights. 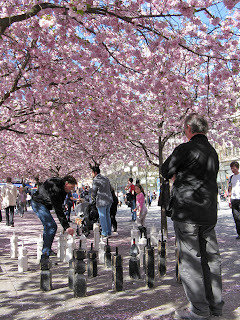 office workers eat picnic lunches in the sun, and retired men play chess under the trees. On the weekends, the park’s many cafes and food stands are busy round the clock. Some of the cities most beautiful flower gardens lie within the park, and flower displays change with the seasons. 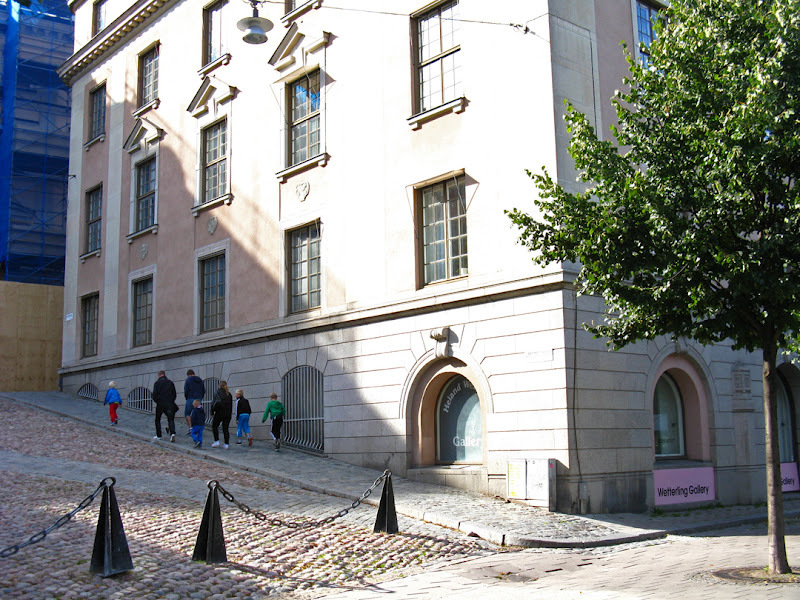 A newer addition to Kungsträdgården. Several of these glass pavilions were recently built on the east side of the park, shielding the park from the moderately busy road. The facades facing the park are all glass while the road-side facade is more closed except for large, pop-up windows (right). The slightly bowed roof form reminds me of pagodas (left). Translucent awnings filter the western sun (middle). Kungsträdgården, due to a combination of its central location, busy entertainment calendar, and many eateries, is one of Stockholm’s most successful urban environments.